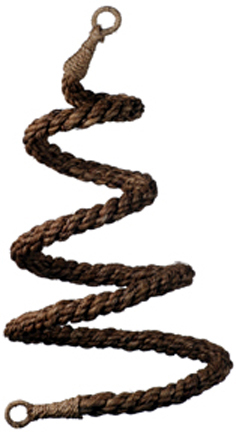 Abaca Boing is a handy curl that can be hung vertically or horizontally. There are hoops on either end so use your imagination and get a little creative. If you're going to hang horizontally, use the bottom loop to hang a toy and make the most of your real estate. OR use it horizontally like a bridge. No matter how you hang it, the Abaca Boing will be a great addition to your parrots environment..